As with many recognizable and registered breeds, some of these American Terriers are produced in a 'toy' size. Purists will say that "the original is all that is necessary" but clearly this isn't so, as the variety of 'toy' sized breeds attests to. People often simply prefer the smallest sizes as pets, especially those who's living space is restricted by square feet or city/county legislation. Many of them were developed as toy sizes to start with, such as the Chihuahua and Yorkshire Terrier. But many others that we assume were always one size began as a different version - both the Doberman Pinscher and Miniature Pinscher are an example of this, thought to have the German Pinscher - a mid sized dog - as a parent breed. 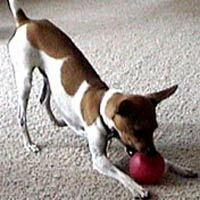 These American Terrier breeds also have a 'toy' size, even though they are already smaller dogs in origin. To this point they are only registered as such by the Universal Kennel Club International, which offers a program of veterinary certification as to 'toy' size and weight. However many breeders do produce the toys, just as a natural 'by product', along with the miniature and standard sized varieties. A 'toy' sized Hairless, Rat or Teddy Roosevelt all weigh ten pounds or less, and many of them are clearly smaller in height than their already small but breed-standard sized counterparts. Don't let that fool you, they are still all Terrier! And as a bonus, these smaller Terrier versions seem to be fairly clear of many health problems that can plague other toy breeds. 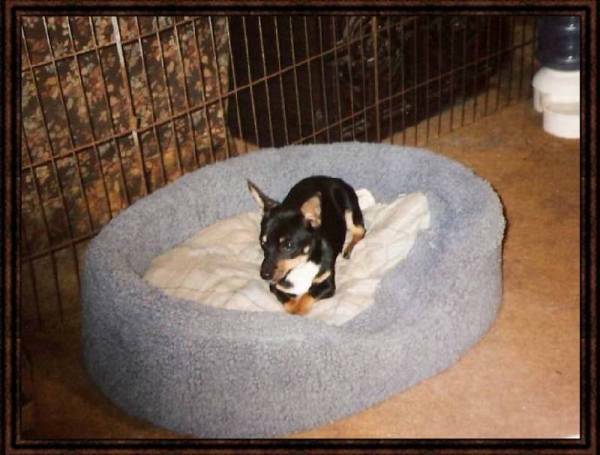 Sig, a 6lb RT owned by Kennessee Valley Kennels. Keiran, a 5lb TRT bred by the manager of this site. These little fellows follow their respective breed standards in everything aside from size!